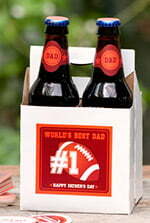 Add some personality to your mail! 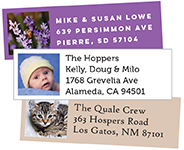 What better way to say thanks to our customers and friends than to offer free address labels. To get started, choose a style, above. 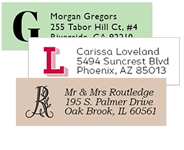 Then type in your name and address, choose font, color, monogram and/or icon. Upload your photo if you choose a photo style. Share this great offer on Facebook. 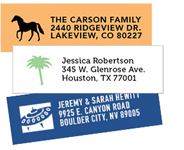 We'll then print and ship your free address labels to you within 24-48 hours and you're all set, no purchase necessary! 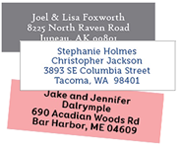 If you find your new address labels, prompt delivery, and our excellent customer service to your liking we hope you'll take some time to peruse our other address label styles and Evermine products. 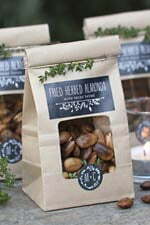 We know you'll love our other custom made items and gift accessories. Don't wait, this offer is subject to change without notice. 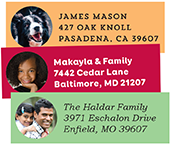 Offer is limited to one free set of address labels per person. Visit the Evermine Blog for more inspiration. 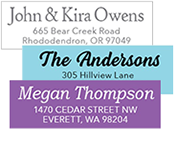 We have ideas for Thank You Cards, Wedding Invitations, Party Invitations, Envelope Seals and much more.